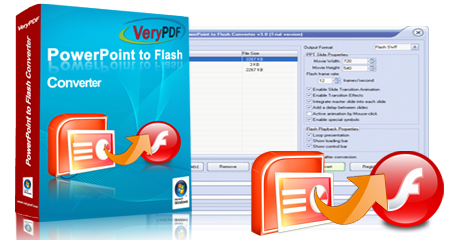 VeryPDF PowerPoint to Flash Converter is developed for converting Microsoft PowerPoint documents to Shockwave Flash movies. This application can exactly represent the original PowerPoint presentation in a created Flash movie. It can retain the animation and audio effects of an original PowerPoint document. Windows 2000/XP/2003/Vista/2008/7 of both 32 and 64-bit. PowerPoint to Flash Converter can transfer the PowerPoint visual effects to new created Flash movies. It can retain more than 170 animation effects and all slide transition effects of PowerPoint 2003. It also supports converting embedded videos to the new flash movie. In created Flash movie from PowerPoint, you will not lose audio effects of the original presentation documents. 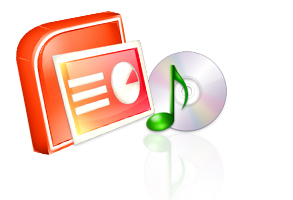 PowerPoint to Flash Converter can retain sounds for animation effects and slide transitions in WAV, MP3 and other audio formats. 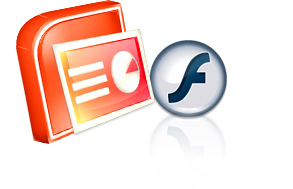 You can easily convert multiple PowerPoint documents to Flash movies with PowerPoint to Flash Converter. It supports drag-and-drop operation which lets you directly drag your PowerPoint documents from Windows Explorer and drop them onto the graphical interface to add them to the batch process queue. Convert all slides of one PowerPoint document to one SWF file. Retain more than 170 PowerPoint 2003 animation effects. Retain all PowerPoint 2003 slide transition effects. Retain sound effects of visual animations, in format WAV, MP3, etc. Retain sounds of slide transitions, in format WAV, MP3, etc. Support special symbols in PowerPoint. Support GIF clip arts in PowerPoint. Specify frame width, frame height and frame rate of Flash movie. 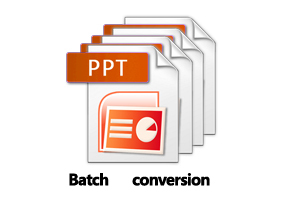 Batch conversion which can convert PowerPoint documents with one click. Option to disable effects of slide transitions and animations. Option to transit slide with time delay or manual clicks. Retain action buttons and hyperlinks. Option to show loading bar and control bar of Flash.